Non-hosted adsense account is the most widely sought by most adsense publishers, on average they already have adsense account but the account is hosted account. indeed non-hosted account has many benefits and advantages over non-hosted account even I've been asked by a friend to be made a non-hosted adsense account but after I registered and accepted by adsense but I got is a hosted adsense account, whereas before I always get a non-hosted adsense account. 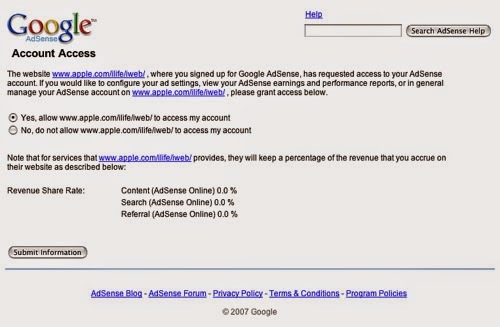 There are no provisions or special conditions to get the non-hosted adsense account, on my previous article I have discussed about how to easily register with Google Adsense and the way that the blog quickly approve by google adsense but the article is not clear on whether the account that will come later hosted or non-hosted. for that I will share to the readers here about how to get a non-hosted adsense account the opinion and experience I had. 1. Blog which you will submit to google adsense should be at least six months. That's some of my requirements to obtain a non-hosted adsense account, hopefully this article useful for my beloved readers. if any of the readers who have questions or want to simply add other requirements please be submitted in the comments box that is on the bottom of this article. Leave your blog address if also commented that I can return to visit and leave a comment on your blog. follow and look forward to continue the articles interesting and useful article from this man who fights hunger.